Those Sonic cups DO NOT belong to me! What could go wrong when the two most AHDH people in the district are in charge of the scorekeeping?? 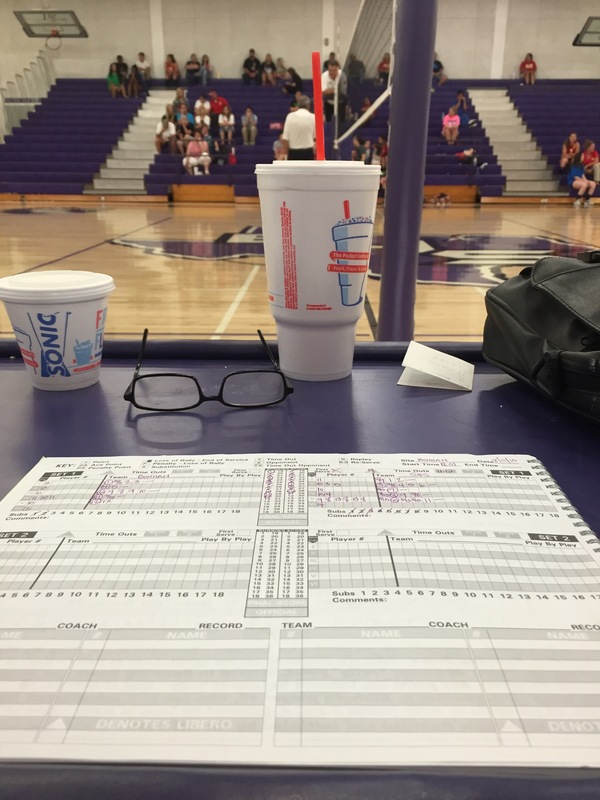 The time not spent in the gym officiating has been a blessing, though! I have actually been able to spend a lot of time with the kids, for which I am very thankful. Bobby and I even twisted Logan’s arm into seeing Mission Impossible with us on Sunday afternoon. I was more excited about Logan coming along than I was about the movie! The weekend was packed! Cycling, running, movie, pool party and birthday dinner for Bobby just to name a few. 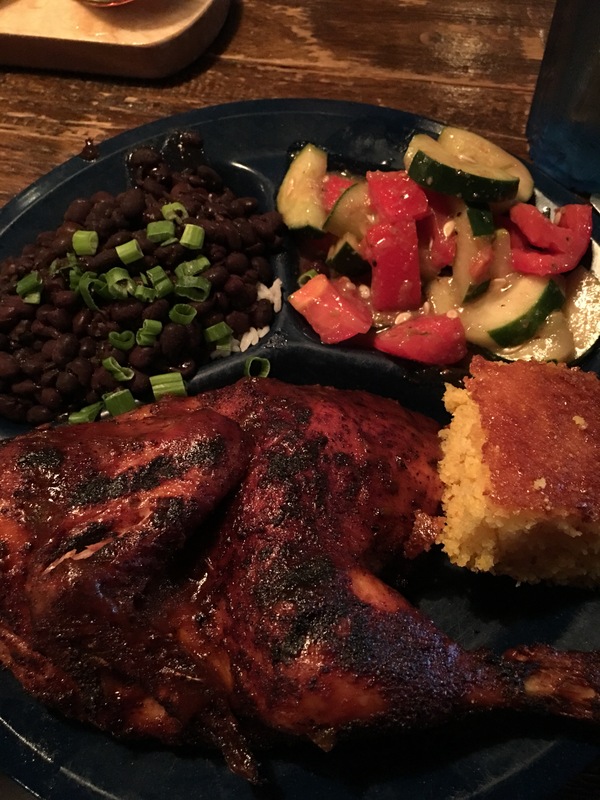 I realized yesterday that it is time to think about marathon training. I will be running Dallas Marathon on December 13. I considered running a different marathon (for about a nanosecond), but I STILL have unfinished business out on THAT course. My main goal is to remain injury-free. I haven’t had time to built a good base since my return from the stress fracture two weeks ago. Even though things are going well, it is more imperative than ever that I address every little ache and pain before it blossoms into a full-blown injury. I think that not officiating this season will free up enough time for me that I can stay focused on this part of the process. 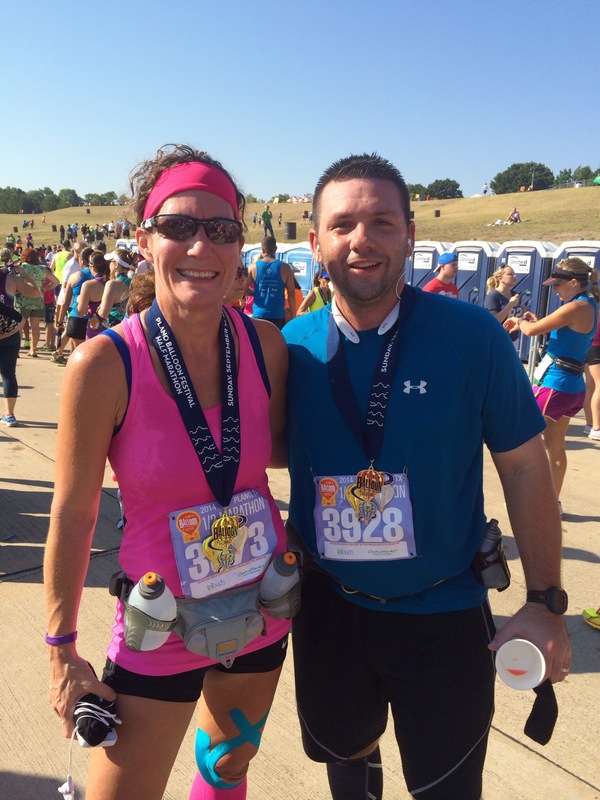 I ran most of Plano Balloon HM last year with Taylor, one of Taylor’s former club coaches (it was his FIRST!). I *said* it was a training run, but nearly killed myself trying to PR when he told me to run ahead at mile 11 and I realized I could get close! By focusing on the half marathons, I’ll be half-way through “marathon training” before I give much thought to Dallas. It may not be the best way to PR, but I figure I could walk it and get a better time than I had last year. (Let it go, Jen. Let it go.) Honestly, I would like to run a 4:00-4:15 marathon. Not even sure if it will be possible, but I’m not going to spend much time focusing on it. Plus, if I build my base properly and add in the appropriate speed work, I may just surprise myself! The bottom line is that I want to run the race healthy, whatever that means for my time. Last year I needed to know that I could finish. This year I need to know what it feels like to run a marathon without nagging injuries. What can I say? I’ll probably never be satisfied! Running is going well. In the spirit of full disclosure, though, I am still having some issues with ankle stiffness and soreness post-runs. This was very stressful to me at first, because mentally I feel injured and keep waiting for the other shoe to drop. However, the ankles are less stiff/sore after each run and it is all working out more quickly than before. As far as any issues during my runs – I am happy to say I have nothing to report!! I have worked my way up to 20:1 intervals x 3 without having any problems, so my next run will be a continuous 45 min run! The recovery from that should give me a good gauge of where I stand. If all goes well, I’ll be running a 6 mile long run this weekend in preparation for Plano Balloon Half Marathon!! I’ll try not to be the sucky-sometimes-blogger in the weeks to come. The start of school on Monday will undoubtedly shock me out of summer mode. I can almost feel my increase in productivity now! Happy Hump Day AND HAPPY BIRTHDAY to my very special friend, Carmen! Something happened this weekend. Almost 2 years of searching, debating, contemplating and discussing culminated in finally settling on a tattoo, then losing my tattoo virginity. Wayyyyy back when I was training for my first marathon, I decided that I wanted to get a tattoo to commemorate my accomplishment. I spent a lot of time during training trying to decide what I wanted and where it would go. Of course, the race was cancelled due to a freakish ice storm, aka Icepocalypse, which bought me time to decide. I looked off and on throughout the year, finding things from time to time that spoke to me, yet never finding something that I felt confident I could put on my body and be happy to see there 20 years down the road. I wanted a tattoo that spoke about running, but, then again, deep down inside, I wanted something more meaningful. I didn’t take lightly putting something PERMANENTLY on my body. So the marathon that I actually ran came and went, and I was no closer to finding “THE tattoo” than I ever had been. I finally decided a few weeks ago that it was time. I just knew it in my gut….and I always trust my gut. 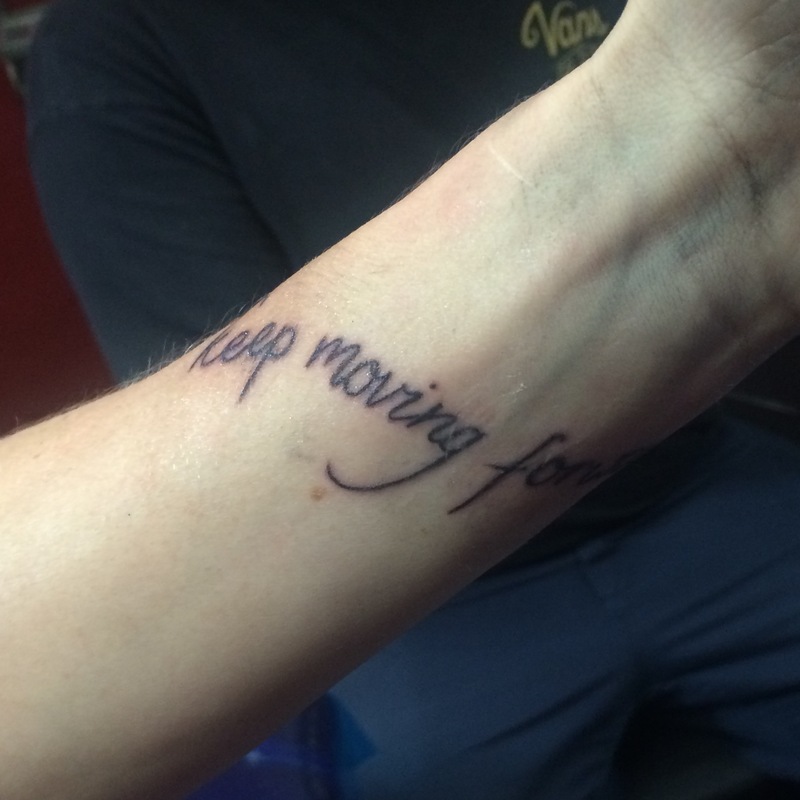 You see, a couple months ago, around MLK day, I started thinking that “Keep Moving Forward” might be the tattoo for me. Still, I wanted to wait and let the idea simmer and percolate for a while. And recently, the idea had matured and blossomed into something that I was comfortable living the rest of my life with. I LOVE Martin Luther King, Jr. and all of his quotes. But I especially love the one (that I chose) that runners often quote, “If you can’t fly then run, if you can’t run then walk, if you can’t walk then crawl, but whatever you do you have to keep moving forward.” So it does have a connection to runners and running. And it had a connection to my marathon. First, I trained for this marathon TWICE. Then, with my ITB injury, finishing was a mental and physical challenge, but throughout the race, I kept moving forward. During the last 8 miles when every single step was so painful, quitting was never an option. So the quote gave me a real, emotional tie to my marathon, which totally commemorates the race! This quote speaks to me on so many other levels, though. Most of you who know me or who have read my blog much know that I lost my dearest friend 11 years ago. That was the biggest and most monumental life test I have ever experienced. To say moving forward was a challenge would be a gross understatement. I didn’t want to move forward….I didn’t even understand how I could go on; how I could live. I was so devastated. My heart was smashed into a thousand pieces. But I did go on. And I did live….even if at first I just went through the motions, but I was doing. Little by little, moving forward took a bit less effort. The sparkle slowly returned to my eyes (but not completely until I found running). In all honesty, this tattoo is as much (in reality, MORE) about Allison as it will ever be about my marathon. Every time I look at it, I will be reminded that I am NOT a quitter and I CAN overcome whatever life throws my way. It isn’t lost on me that Martin Luther King, Jr. was one of Allison’s favorite people of all time. In fact, Kaitlynn recited MLK’s “I Have A Dream” speech for the Princess contest one year. Every time I look at this work of art on my body, I’ll know she is with me. Finally, this tattoo speaks to my faith. It’s no secret that I identify myself with the progressive faith community. I hope that my actions speak to the fact that my main concern is acting justly, loving kindness and walking humbly with my God. (By the way, Micah 6:8 is my favorite Bible verse 🙂 ) I (we) can’t rest until everyone is treated justly and with kindness and dignity. Until then, I will keep moving forward and doing what I can, where I can, when I can. As for the placement of the tattoo, that has a significance as well. I had it placed on my left forearm. I wanted it on my arm so that I could see it everyday. When this idea originally came to mind, I imagined it somewhere on my foot. As my ideas evolved, I realized that I needed to be able to see it. But my left side….my left side is my weak side – the side prone to injury. I needed it to be on the weaker side because I need to focus on that side in order to be whole…as a runner specifically. Last weekend, Alli accompanied me (I TRIED to get her to stay home) when I went in to make the appointment and put the deposit down. On the way, Alli said, “What if you have surgery on the spot where you get this tattoo? Will they be able to put it back right?” Only Alli would see that angle! I had to admit, it was something to think about! So the date had been set and a good friend accompanied me so that she could lose her tattoo virginity as well. 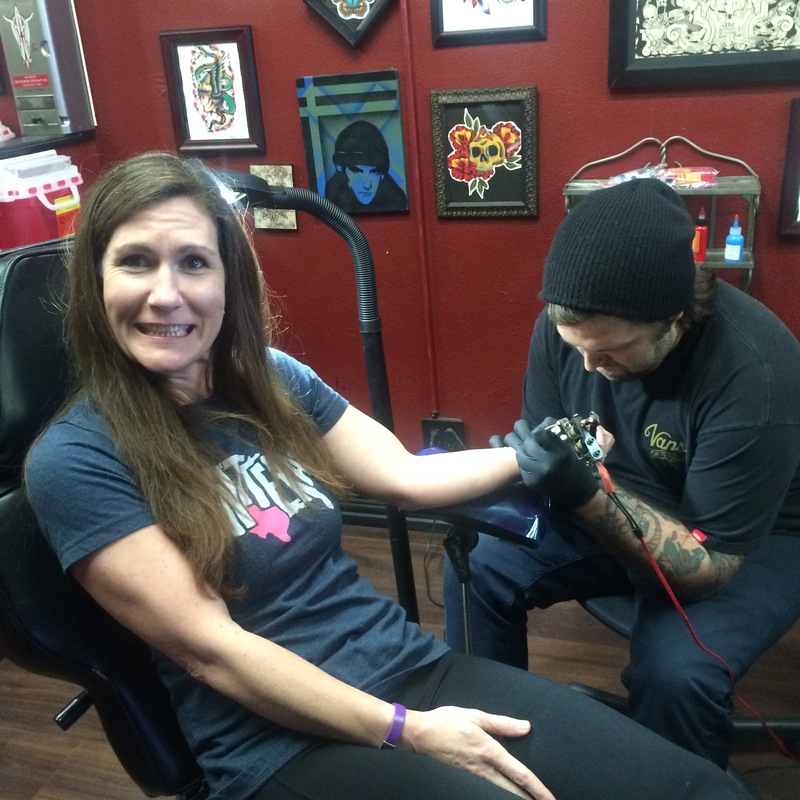 Of course, having never had a tattoo, we had NO CLUE what to expect! 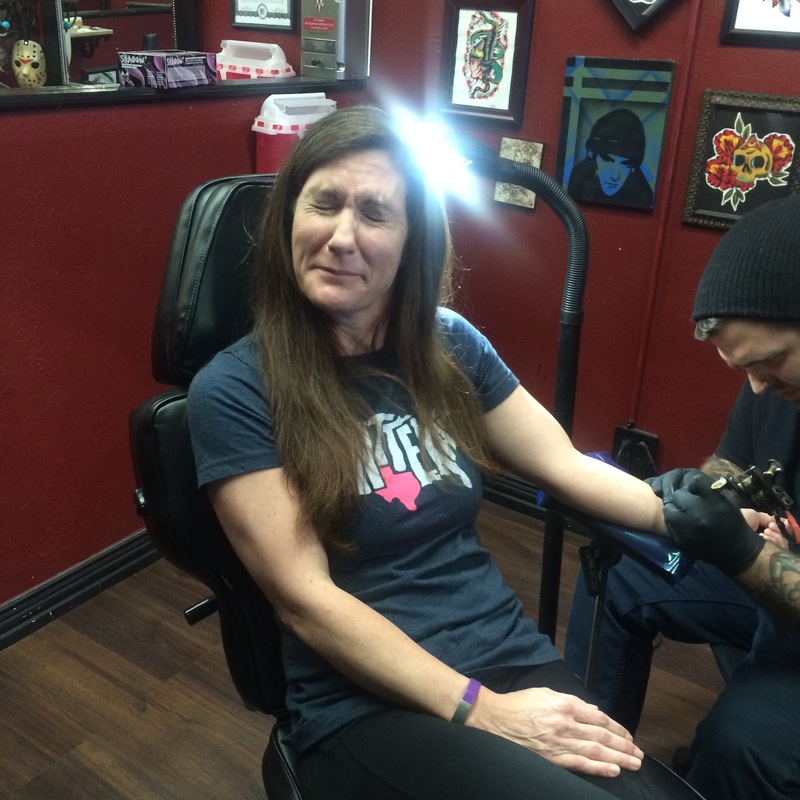 Luckily, Taylor came with us so she could get a second tat (and keep us straight). 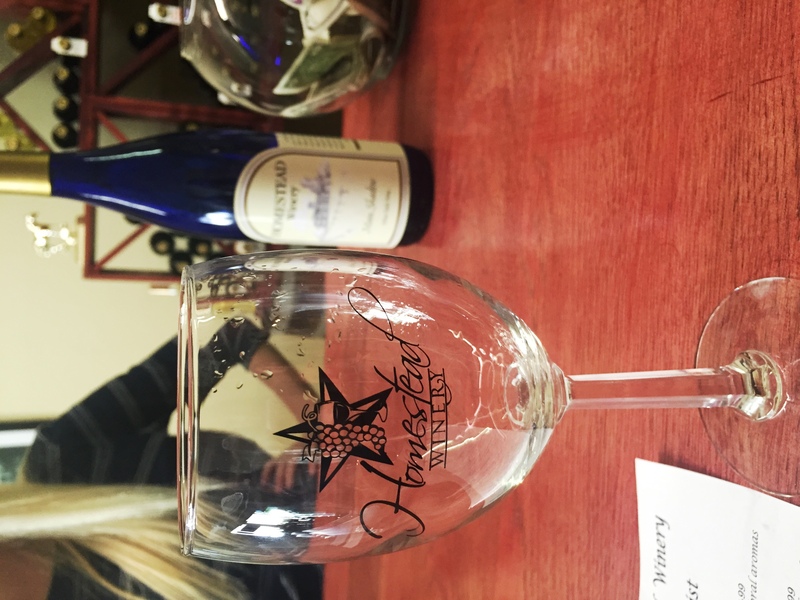 We have friends that own Homestead Winery (in the metropolis of Ivanhoe, Texas) who have a tasting room in Denison. 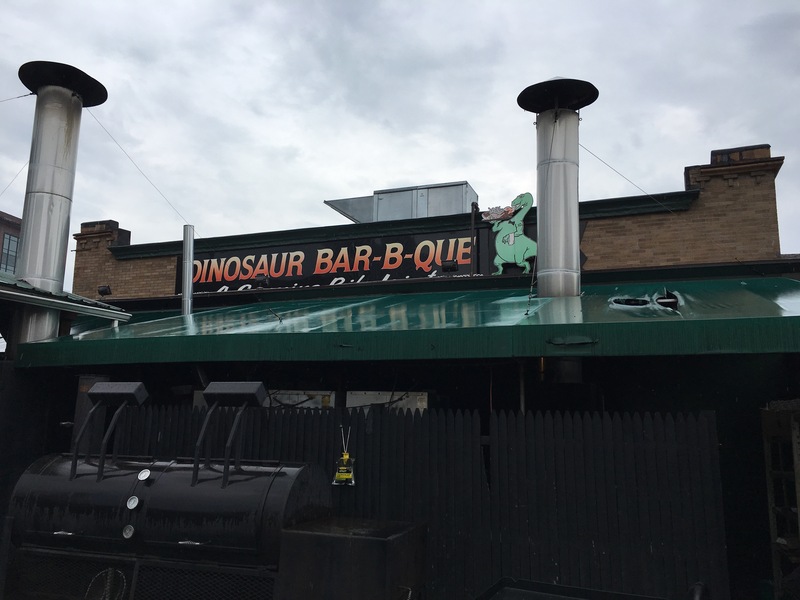 We decided to make a stop there since Taylor had never been. Of course, Taylor is taking full advantage of being 21 and looks for these “opportunities” whenever and wherever they arise. We tasted just enough wine to take the edge off, then were on our way. May I say that Orange Muscat was pretty yummy. I came home with a bottle of that! We talked to our artist about what we wanted and he set off to draw them up. Aaaaaand the first draft didn’t work for me. If you know me, you know that I try to be tactful (most of the time) because I don’t want to unnecessarily hurt someone’s feelings. Well, I HATED that first sketch. As I was trying to formulate in my mind how to break it to the guy, Taylor said, “MOM, just tell him you don’t like that one! Don’t get one you don’t like! !” (OK, for the record, I was NOT going to get something I didn’t like….I was just trying to let him down gently!) So we discussed again what I wanted and when he came back the second time, I was ready to marry it! Surprisingly, I was not nervous at all before, during or after. (I’m sure it had NOTHING to do with the wine tasting prior!) I was a bit anxious, but I think that was just me, ready to git’er done! The actual inking took no time at all and wasn’t THAT painful. However, it was a little painful and my friend was ready and waiting to capture the moment! I am not smiling. I am gritting my teeth. 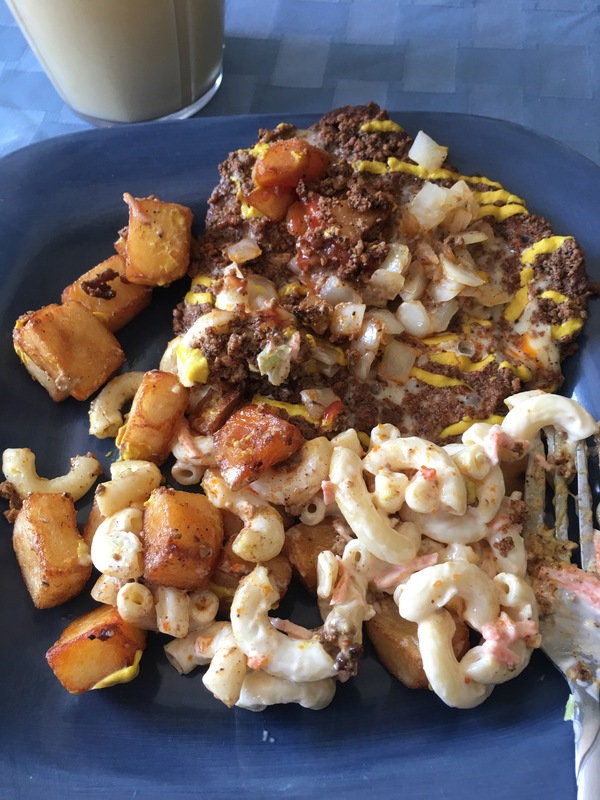 It’s no secret that I usually eat as healthy as I possibly can, but after this experience, we went for some comfort food! And here I sit, roughly 24 hours later, happier with it than I could ever have imagined. I am SO glad that I finally bit the bullet and had it done! Nothing to do with the post except that it is Monday after Spring Break. Last week, the gods of running smiled down upon me. Most of you are probably already laughing, since you already know that the gods of running rarely smile on me. That, or their sense of humor is extremely warped. OK, their humor is probably extremely warped. First, I’ll give a bit of the back story for those who may not know. For 2 years, my friend, Amy, was my trusty running partner. She was the navigator and the pacer. I was the trainer (go ahead and laugh) and the water/fuel girl. Amy LITERALLY held me back – but that was a good thing. When I would get in “the zone” and start to speed up, she would grab me and tell me to slow down!!! I embraced training without her, though – and when I had to run without her I did my own thing when I wanted and how I wanted (which, I admit, wasn’t the SMARTEST approach I could have taken….note running gods’ warped sense of humor.) 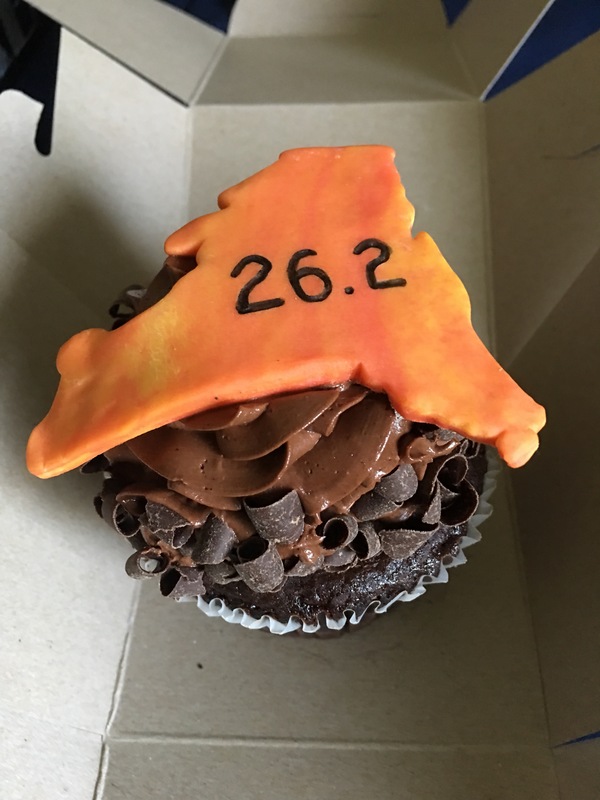 And unless you’ve been living under a rock, or this is the first time reading my blog, I ran my first marathon on a bum ITB and had to take 7 weeks off before I could start slowly running again (which was, no doubt, directly related to the way I trained without a partner). 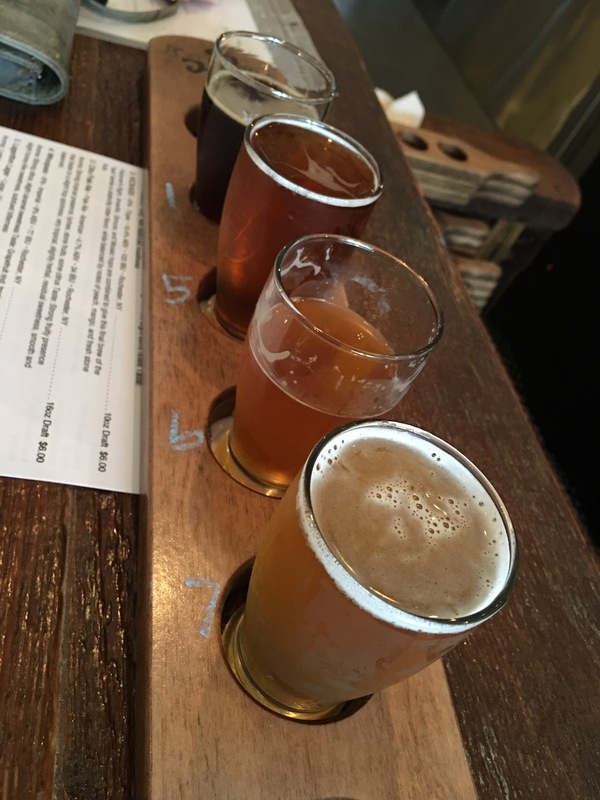 Training post-marathon/ITB rehab has been going fairly well. I have occasional aches and pains; of course at least one of my muscle groups is ALWAYS tight, but I have been dealing with the issues as they arise in a surprisingly smart fashion, especially for me. 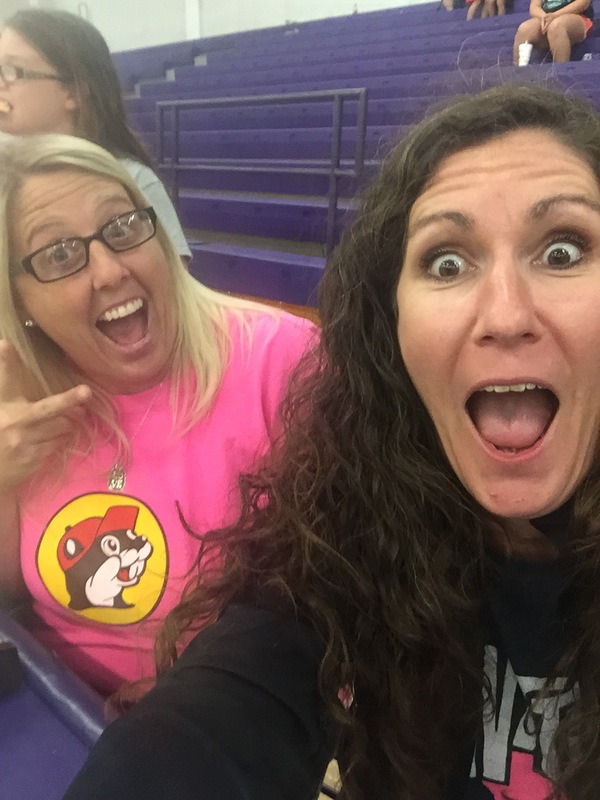 This weekend was a whirlwind of volleyball (I know….what’s new??) 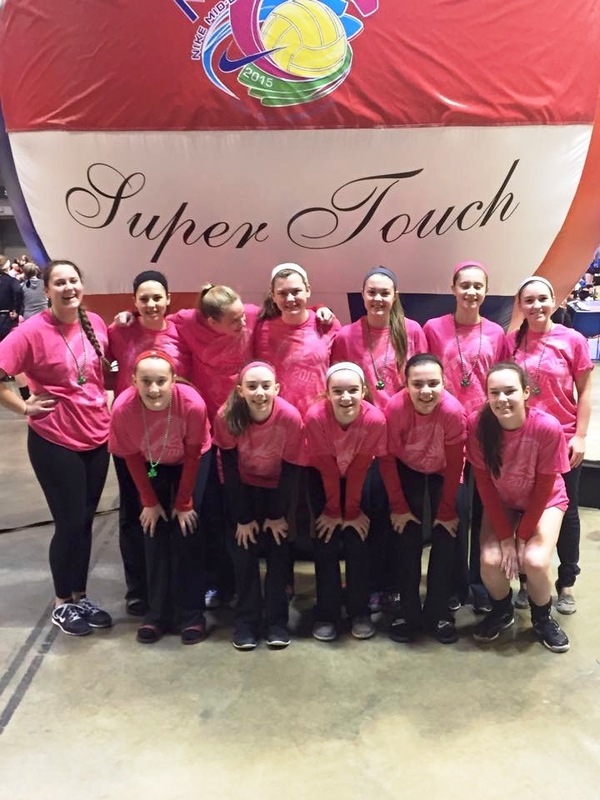 First, the team that Taylor coaches was playing in the Mid-East Qualifier in St. Louis. USAV sanctions a handful of qualifiers across the country and the WINNING team (singular) per division is awarded a bid to USAV Junior Nationals in June. Taylor’s team was playing in a division with 100 other teams and her team made it into the Gold bracket, which was the top 16 of the tournament! 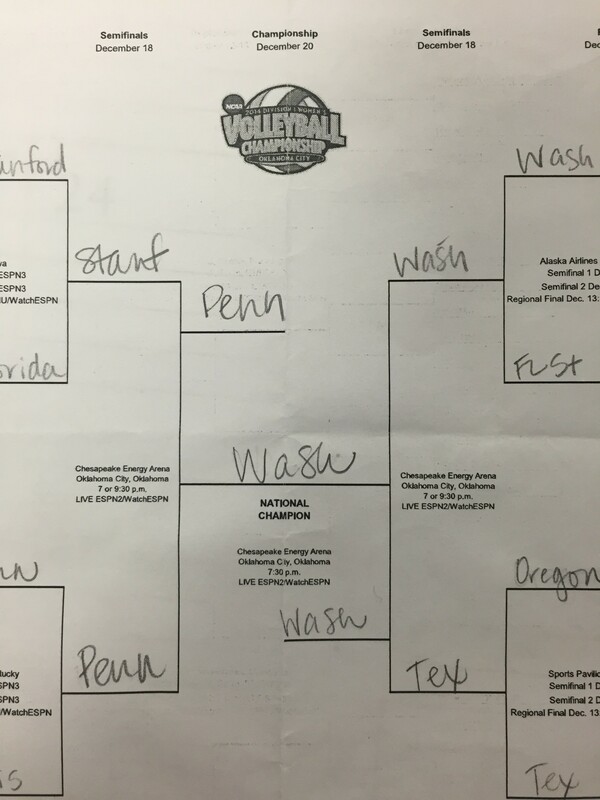 They ended up losing the first match of the Gold bracket to the eventual winner of the division, which effectively ended their hunt for a bid, but she was so proud of how her team ended up. Taylor is back row, far right. Yes, she is shorter than ALL her players, even her liberos. On the fight into St. Louis, Taylor said the guy next to her kept bending over and talking to his feet. She wasn’t quite sure how to react, so she asked if he was talking to her. 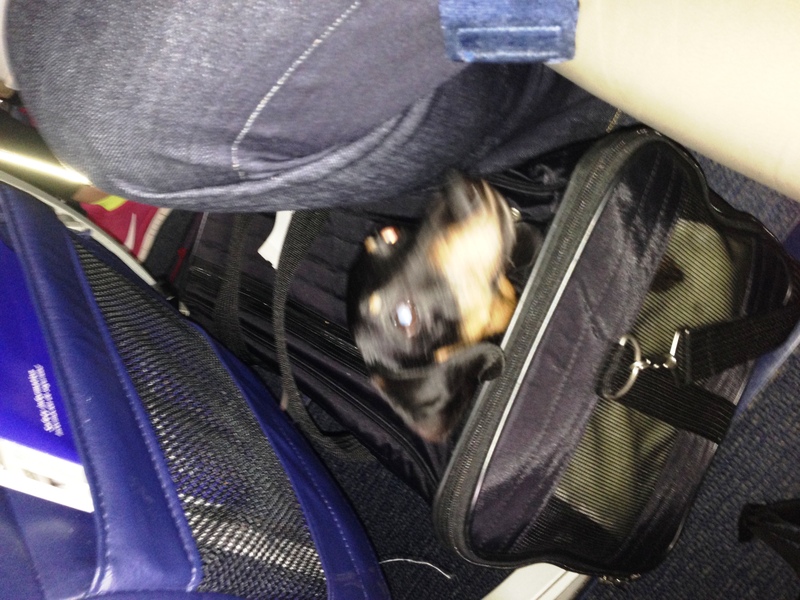 He said no…..he was talking to his Dachshund, who was IN his carry-on bag! She got the biggest kick out of it! Alli played in a tournament this weekend as well. 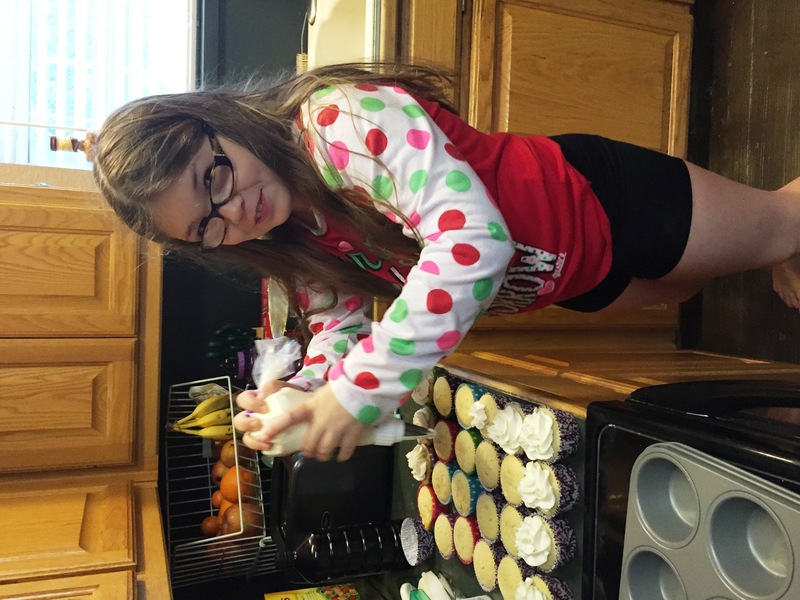 Before we left, she whipped up some cupcakes all by herself! 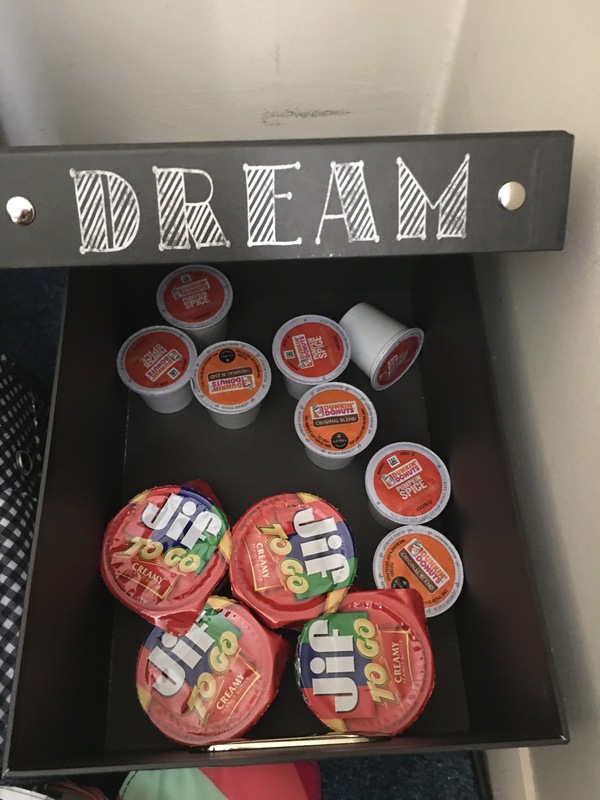 Too bad that she left them on the counter, which means we didn’t get to share any with her teammates. On Saturday, we were in a terribly weak pool. Even though we were seeded 2nd in the pool, we easily won every game. No one scored on us more than 16 points per set all day. Alli served at least 50 points, which is CRAZY! She was on a roll and her serves were smokin’ hot! Since the facility was 1.5 hours from home, we reserved a hotel room for the night (because I KNEW we would be back at the gym by 7 AM!) 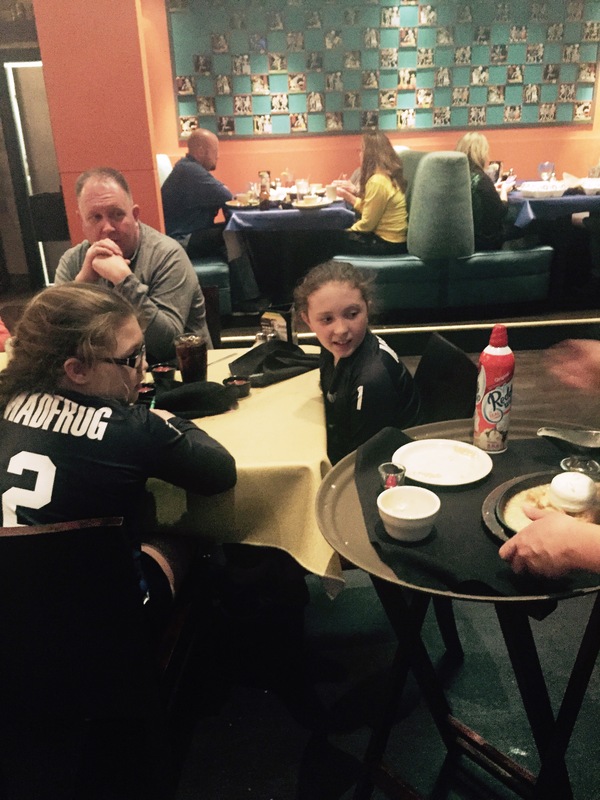 and ate dinner with one of her teammates. Celebratory dessert for earning 1st in our pool! I wish my camera could have captured how wide their eyes got when the server brought out the apple pie. 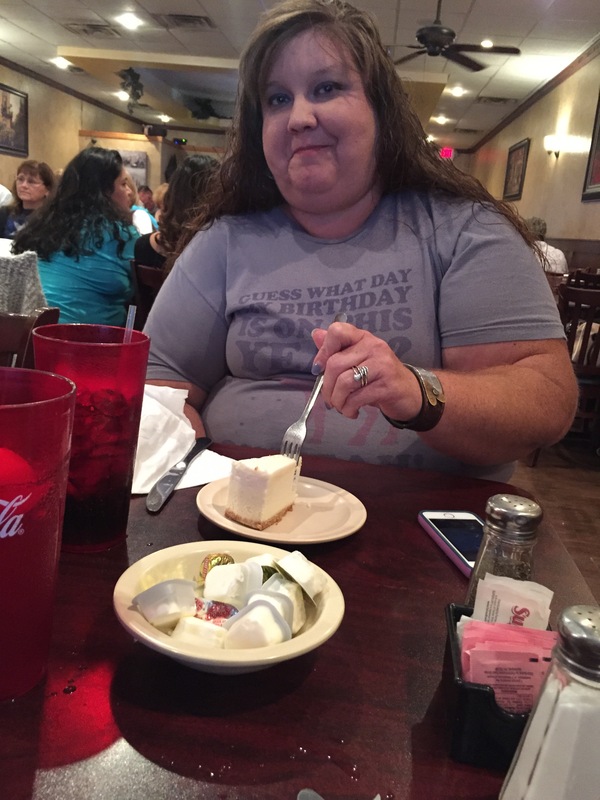 First, she poured cream onto a hot plate, then added the apple pie and topped it with a scoop of ice cream. They enjoyed every bite! 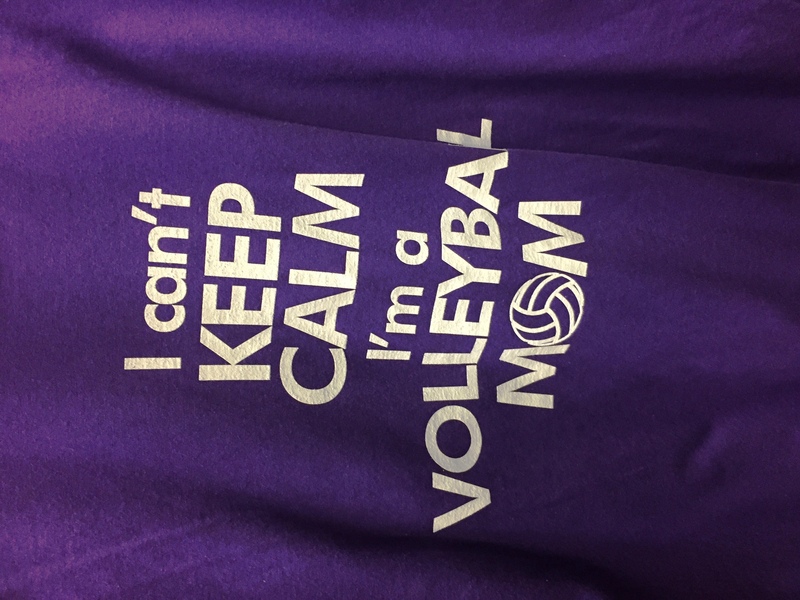 I saw this shirt at the tournament and joked that I NEED it! LOL No…..I wouldn’t actually wear it. But it was fun to joke about it!! A few weeks ago I attempted (and failed) to write this post. I finally scrapped it because I just wasn’t able to get my thoughts onto the page in a way that made sense without rambling on for days. Here’s to never giving up! Originally, I began thinking about myself as a runner while I was attempting to come to terms with my less-than-stellar marathon performance. (By the way, I HAVE achieved peace in regards to the race, accepted it and can genuinely say that I am content.) It was during this time that I had a little epiphany about perception. So how does perception tie into all this? 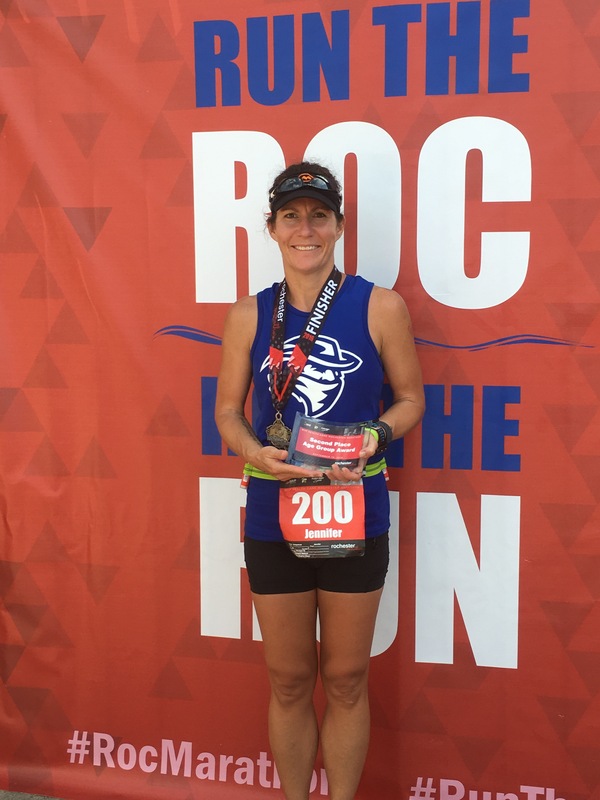 Back to marathon…..I was upset with myself because I wasn’t able to embrace the results and appreciate what I had accomplished. WHY did I feel that way and WHY did I feel like such a failure? When I say that I don’t compare myself to others, I mean it. I am pretty content living in Jen’s little life bubble. However, most of my online interactions are with other runners and that is where the perception comes into play. Even though I don’t compare myself to them, I do think this has kept me from fully appreciating MY accomplishments because my “norm” has become what I see my online friends doing. Gaining understanding of this has helped me in many ways. Like I said, I now embrace my marathon for what it was. But, it also helped shape my running goals for the coming year. I recently shared with someone that often, in regards to running, I feel like a poser. For one, I feel I don’t run enough, cross train enough, stretch enough or foam roll enough! And as much as I hate to admit it, don’t always consider myself a “runner”, even though I KNOW I am! However, my new-found perspective has allowed me to cast away some of these self-imposed standards. So all this got me thinking about running and how I can create a balanced fitness regime and why do I LOVE running SOOOO much? 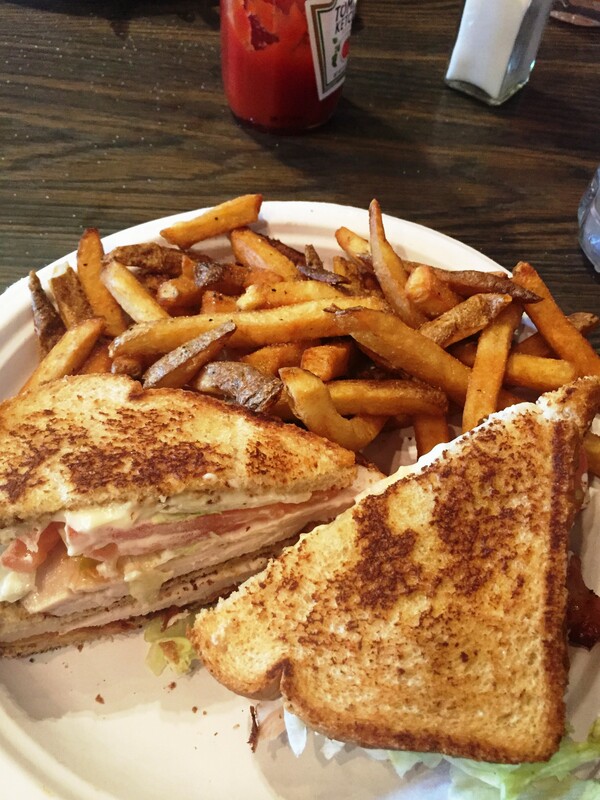 I mean, my whole focus this year is to do all the cross training so I can stay healthy….in order to become a better runner. (I know my focus should be on being fit vs run, but still debating myself on that one.) Initially, I started running as a way to improve my fitness and lose weight. I wanted to be healthy by the time I turned 40. But along the way, I discovered the Jen that had been lost for a while (and I may have developed a little addiction to endorphins). 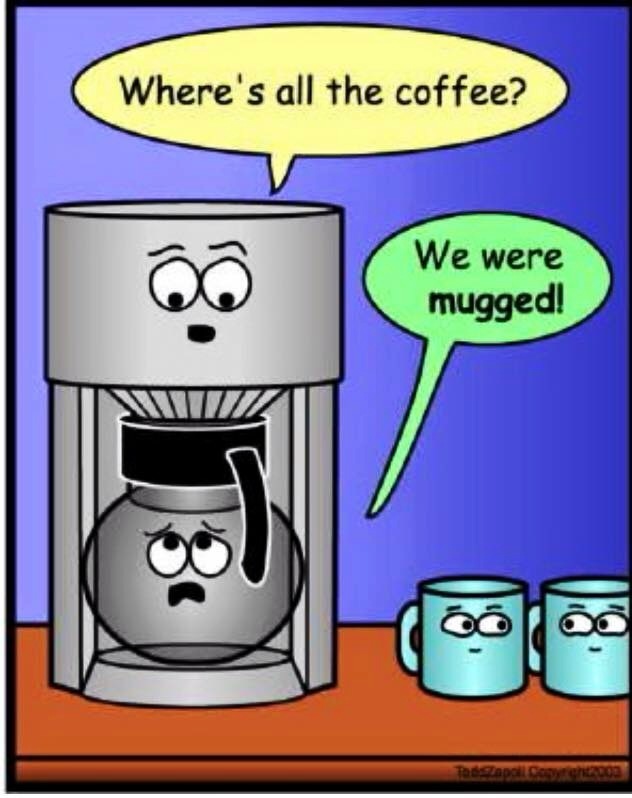 And the reason Jen was lost?? 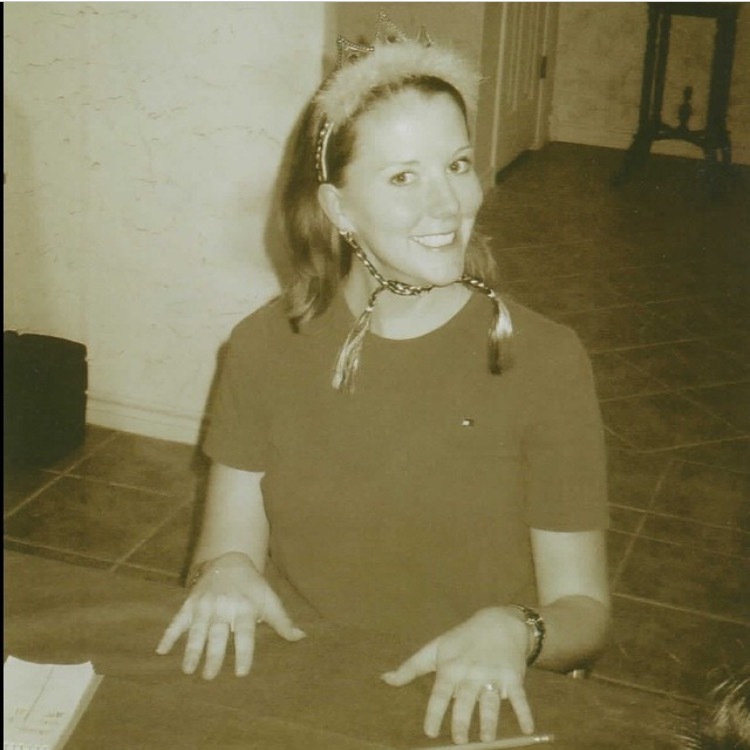 Ten years ago, my best friend, Allison, died suddenly. Actually, our families were best friends. My husband and her husband did almost everything together. Our children did everything together. I can’t describe how close we were and how much I treasured her friendship. She was a soul mate. That loss changed the lives of everyone in my family, and I had a VERY difficult time dealing with it. In fact, getting pregnant with Alli just a month after Allison passed away was the best thing that could have happened to me. But I’m saving that story for Alli’s birthday. Honestly, I spent the next 7 years in a fog, just going through the motions of life. I doubt most people realized how deep the grief was for me, but another of my good friends told me once that my sparkle was gone. I did find enjoyment in my family and in my kids’ activities, but other than that, I was simply existing – going through the motions. But then one day, I started running. Surprisingly, I REALLY enjoyed it. The challenge of making it to the next milestone ignited a passion in me that had been dormant for so long. I still remember the first time I ran a mile. Then two miles. Five miles were HUGE! I said I would never run a half marathon, but I did. 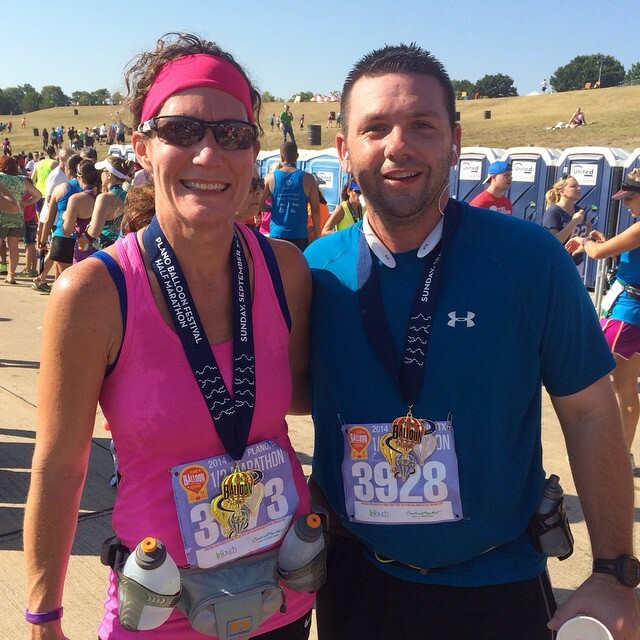 I also said I would never run a marathon….BUT I DID!! Oh, and did I mention that Allison was a runner? She always tried to talk me into running with her and I would just laugh! I know she is so proud and I can feel her with me every time I get out there on the road. Running has given me so much: it has helped me to find my happiness and self-confidence again (happy Mama means happy family! 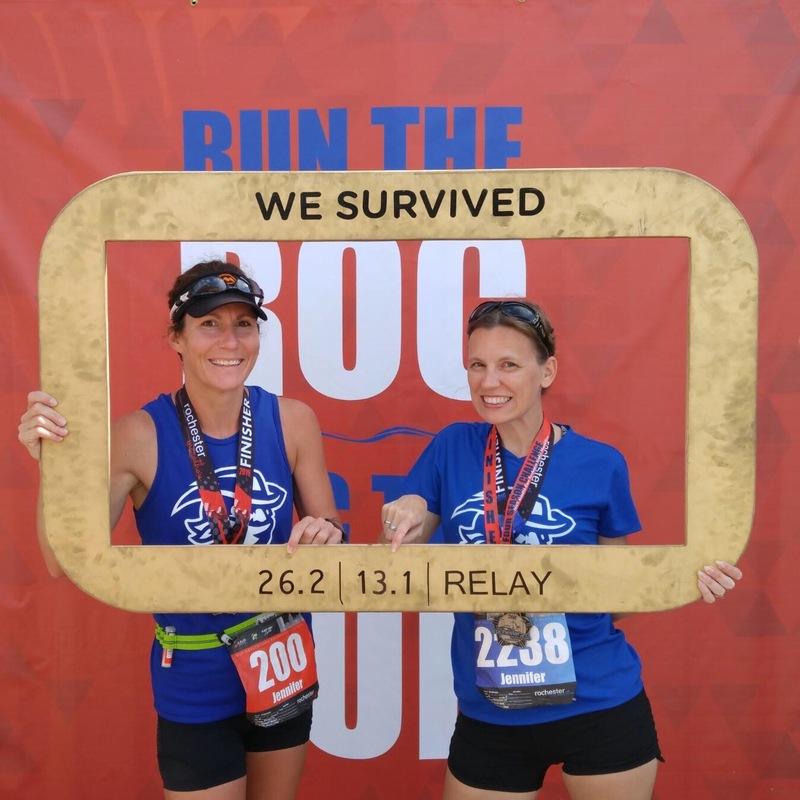 ); it has forged a connection with my kids – I’ve been able to run 5ks with Alli as well as 5ks and a half marathon with Taylor; it has connected me with many wonderful people I would have never met otherwise; and it has shown me that I truly can do anything I put my mind to. So it’s more than running. It’s about living. This little exercise in self-discovery has at least helped me identify some of the forces that drive me to run. And by doing that, I think that I can control my approach to running more intelligently than I did in 2014. 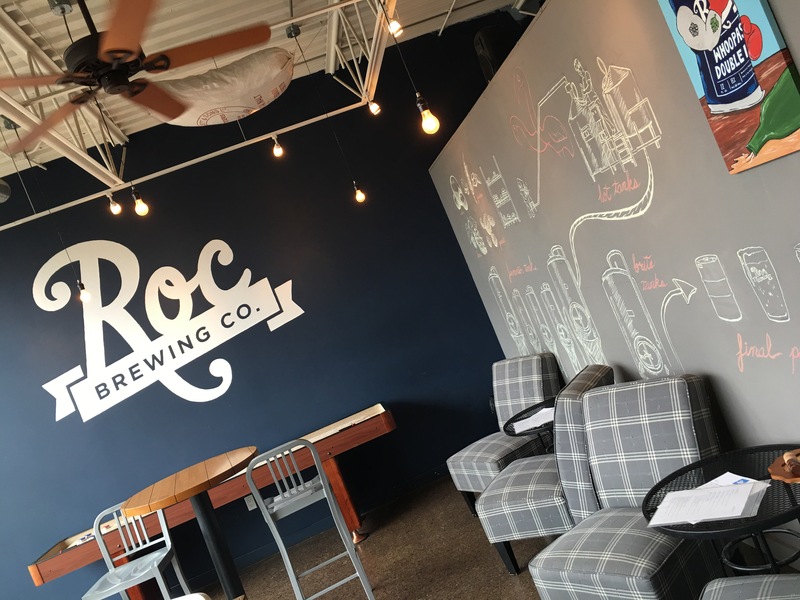 Plus, it is always good to reconnect with your roots. So how does all this relate (in my head, anyway)? As I said before, my word of the year is: Balance. I personally think that nothing can be achieved without awareness of the goal in mind and what is pushing you toward that goal, or away from that goal. All these little epiphanies are (hopefully) pushing me toward my goal of living a balanced 2015 (not only in fitness, but in my life)! Out with the injuries, in with my healthiest running ever! Disclaimer: This is a kind of 2014 recap/2015 goals post all in one. 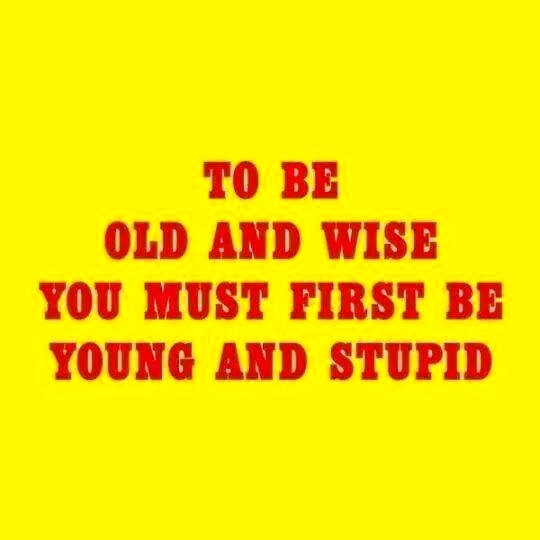 No caption needed really, but I’ve COMPLETELY covered the stupid part, now on to the wise! 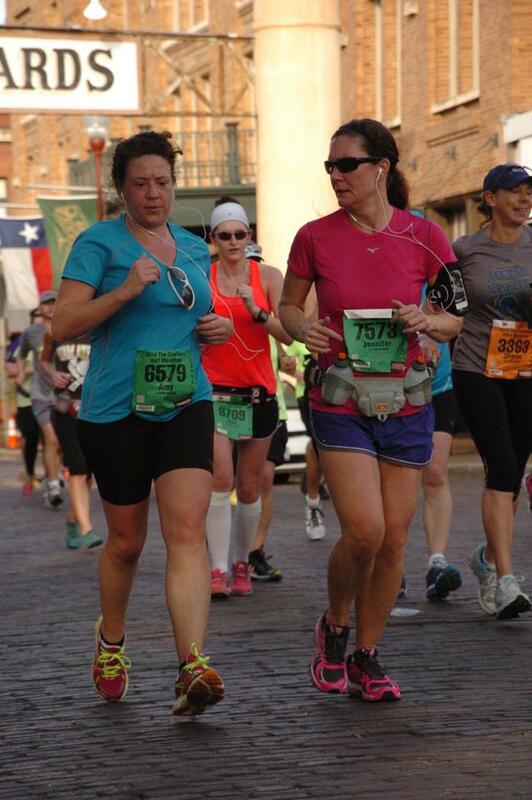 PR’d by over 5 min at Cowtown Half in February, in grueling (for me, anyway) conditions of sticky humid and 60s. I thank my lucky stars that the sun didn’t come out until mile 10. I would have melted. After recovering from my injury, felt stronger as a runner than I ever have! Seriously, my best running to date. I love that healthy, strong feeling. I will run strong again soon. Finished my first marathon, for which I trained twice! (Humor of Mother Nature is all that can explain that!) Initially I was disappointed with the result, but a little perspective has made this day one of the sweetest of the year! 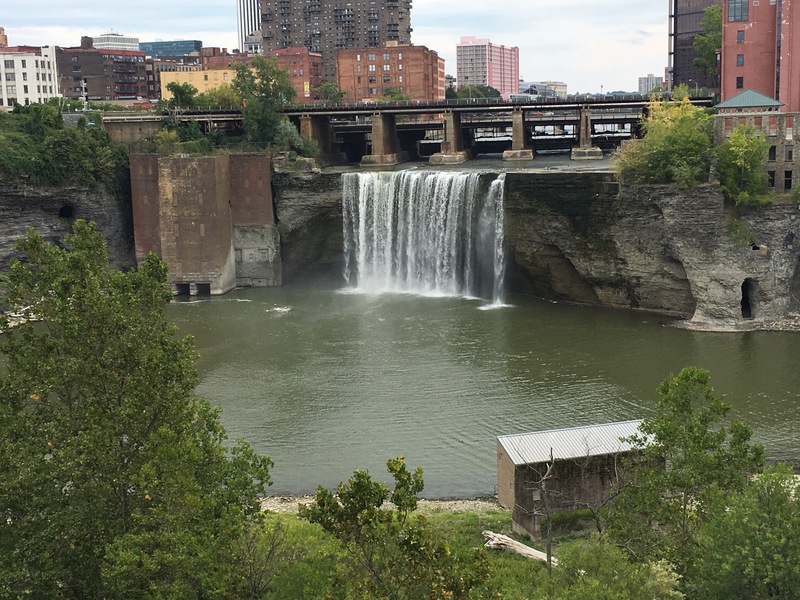 Taylor snapped this beauty of a pic through a fence. Be jealous of her skills. Rest days are good and necessary. In fact, I learned that I am able to go on the no-running/no-workout/anything but walking 2-week DL AND still remember how to run/am still able to run when I’m reactivated. And those first runs after the forced break were ahhhhhhh-mazing!! Cross train, cross train, cross train. I added cross training/strength training and biking in after my injury, but life and marathon training took over in the fall and I gradually did less and less. Paid the price for it, too, during my marathon. But I promised not to go there, so….. Suffice to say that I believe this is the part of the puzzle that helped me run so well early on in the Fall. I CAN run by myself. I have become a better, stronger, faster, more confident, mentally stronger runner on my own. This isn’t a negative reflection on my former partner, rather, running alone required me to develop those skills in order to be successful. However, I didn’t spend as much time injured when I had a partner…..coincidence?? STAY HEALTHY!!! I am working on making my ITB as happy, happy, happy as it can be and once I achieve that, I want it to stay that way!! I will not focus on mileage in 2015. I will, instead, focus on quality runs. My runs will be intentional and planned. Cross train, cross train, cross train. Enough said. 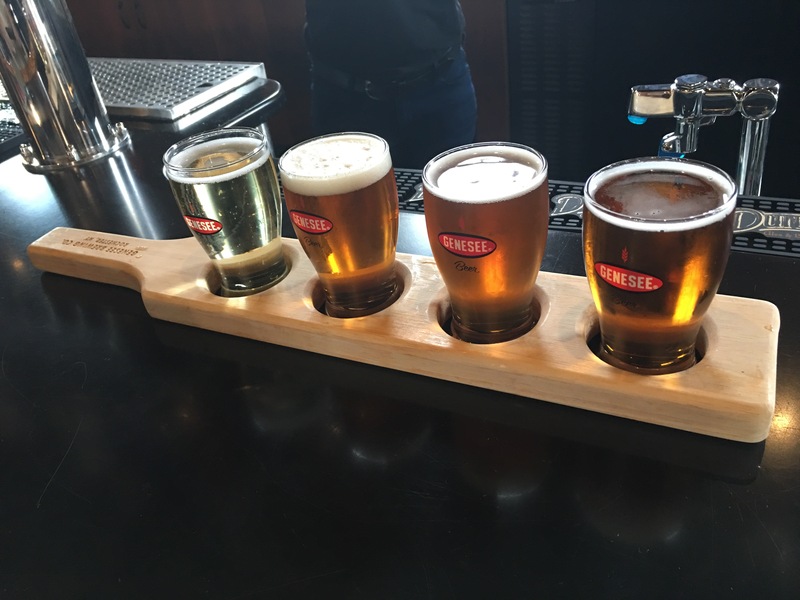 I will ensure that I get my cross training in, even if it means I have to skip a run. (Those of you holding me accountable might want to bookmark this one.) I would rather skip one or two runs than sit out for a few weeks to rehab a preventable injury. 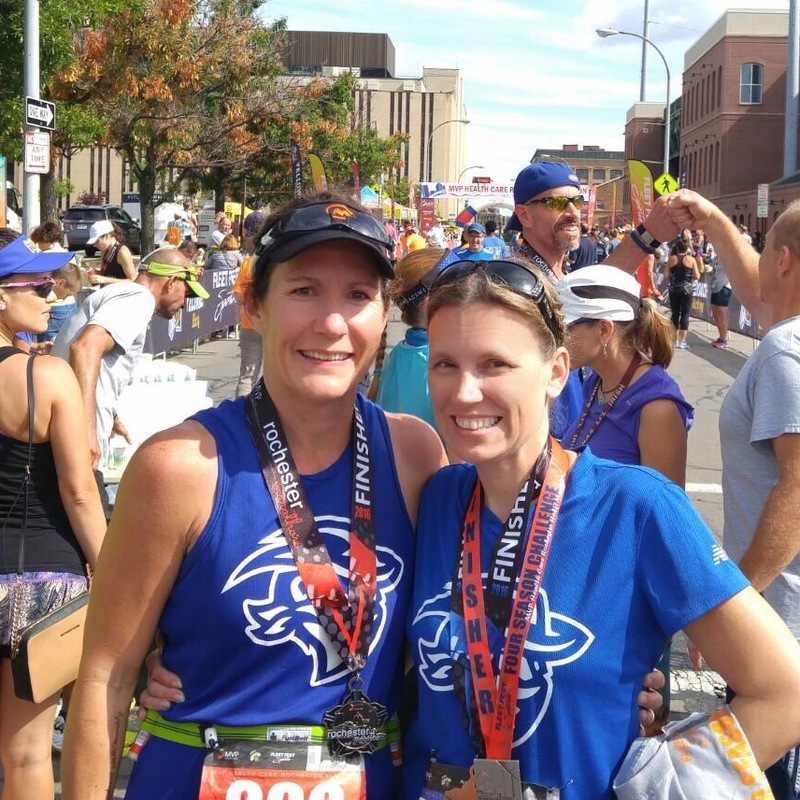 Cowtown Marathon 2016. Of course I want to run another marathon! If my body had been ready, I would have run another the very next weekend. I felt like running the full at Dallas next year might be too soon for me (because I want to build my base back slowly), and I’ve already mentioned how I LOVE that Cowtown course, so this seems like the perfect next-marathon for me! I list this in my 2015 goals because I will begin formal training for it before 2015 comes to a close. I am REALLY excited about this one!!! I hope your 2014 was at least half as amazing as mine was! I was blessed in so many ways during the year. 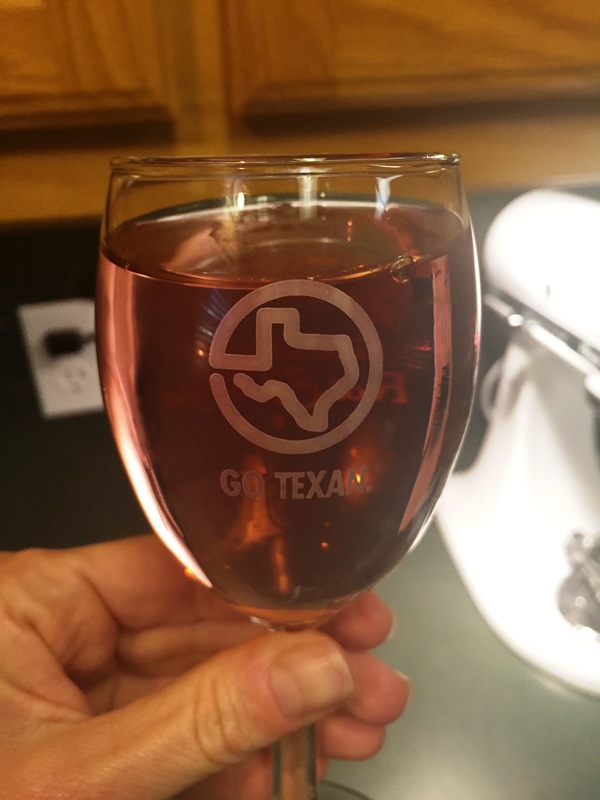 OF COURSE my wine glass has Texas on it!! 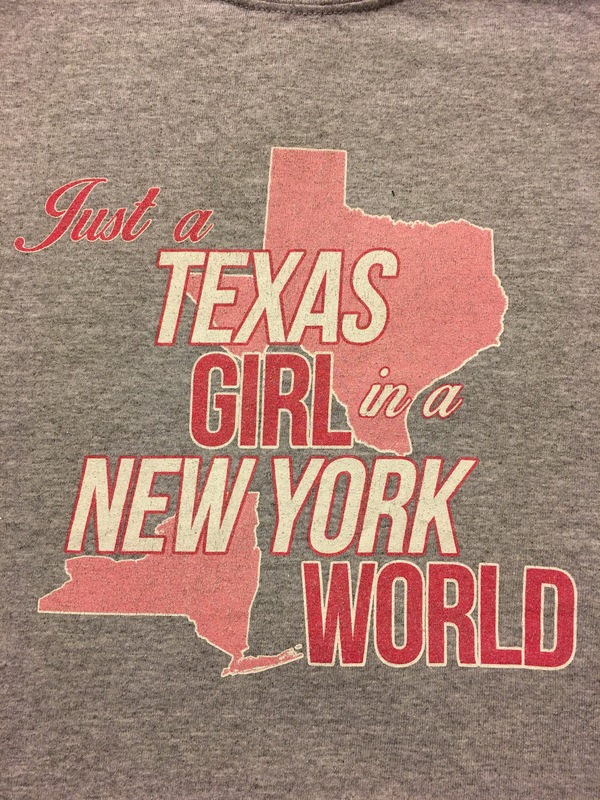 What kind of Texan do you think I am? It’s Friday. 5 days post-marathon. Less than a week before Christmas. But most importantly, last day before 2 weeks off for Christmas Break!!! I must allow my muscles time to heal. 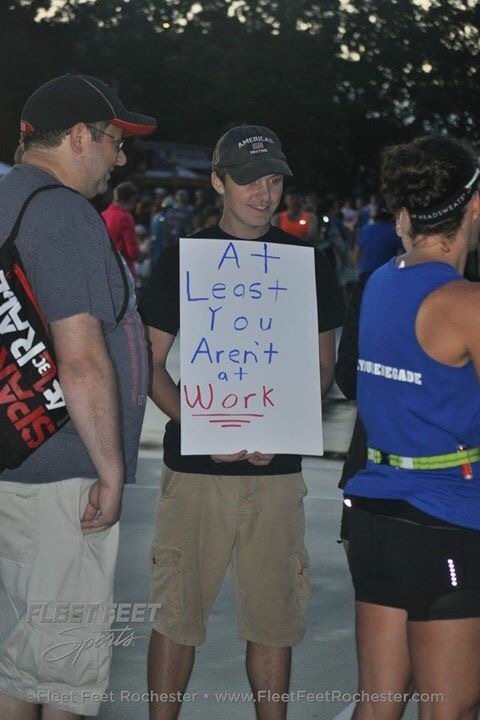 I know that running 26.2 miles with an injury (here’s your sign) put extra stress on all my muscle groups so all those little tears need to heal. After I allow some time for that, I will add in some strength training, then ease back into running. I REALLY wanted to run Hot Chocolate Dallas and The Cowtown Half Marathon in February and March, but I realize that would be paving the way to another injury and I am DONE with injury!! 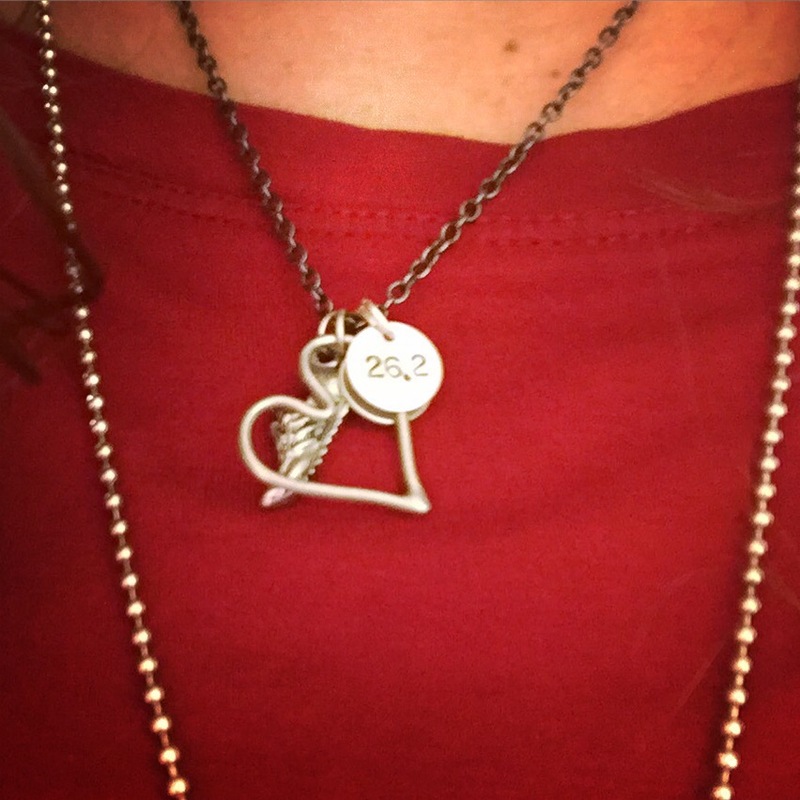 I’ve been waiting a LONG time to put this little gem on my necklace! 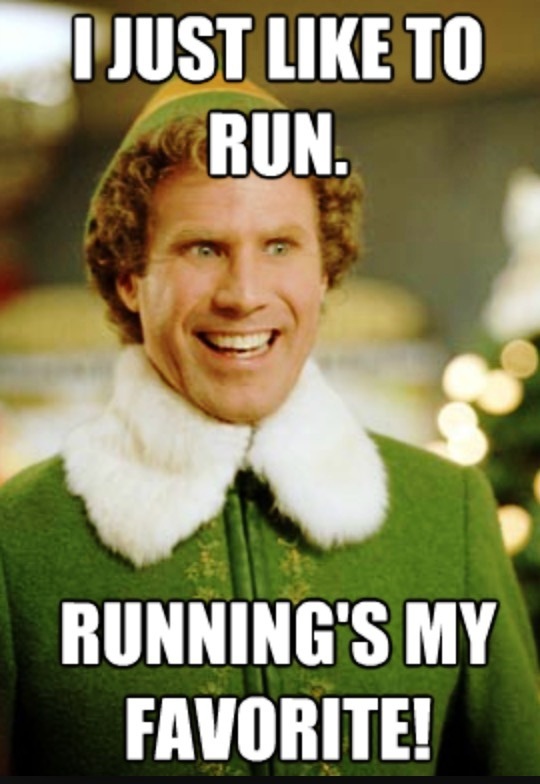 Working in the office of an elementary school at Christmas time means it is ALWAYS a good idea to burn an extra 3,000 calories in a marathon the Sunday before you get out for break. I wish I would have had the mental presence to take photos of all the homemade goodies that I’ve been given over the past week. (I’ll blame this on post-marathon brain fog, but we know I’m always in a brain fog.) As luck would have it, I received many gifts this morning, so you’ll get the idea. Gift from the cafeteria ladies. 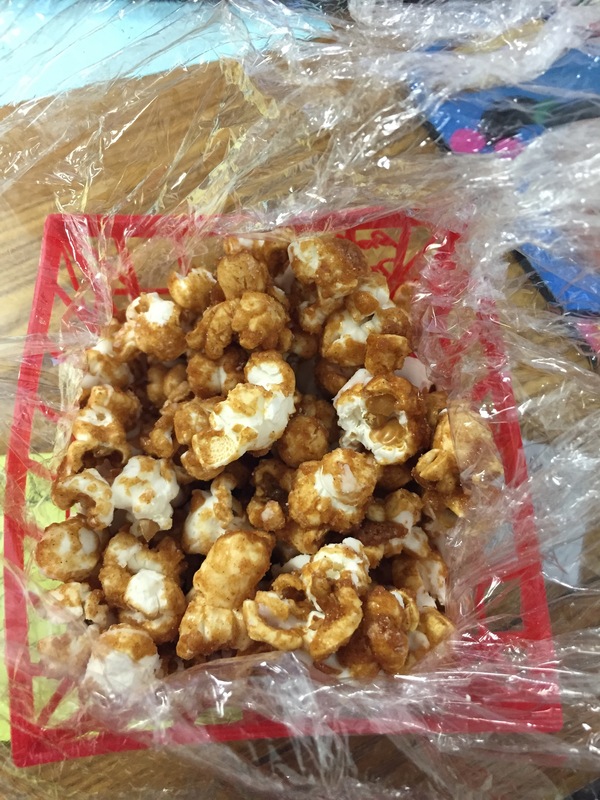 What you can’t see and that I later discovered, is the white chocolate drizzled over the clumps of popcorn. OH. MY. GOODNESS. THIS!!! 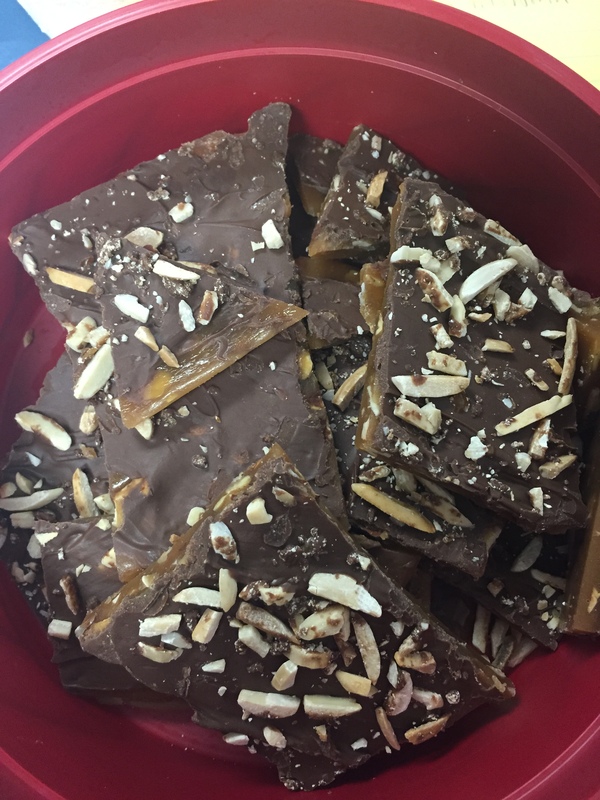 Toffee is my weakness. After I eat all this, I’m going to punish Shannon for tempting me with it. She is the devil! 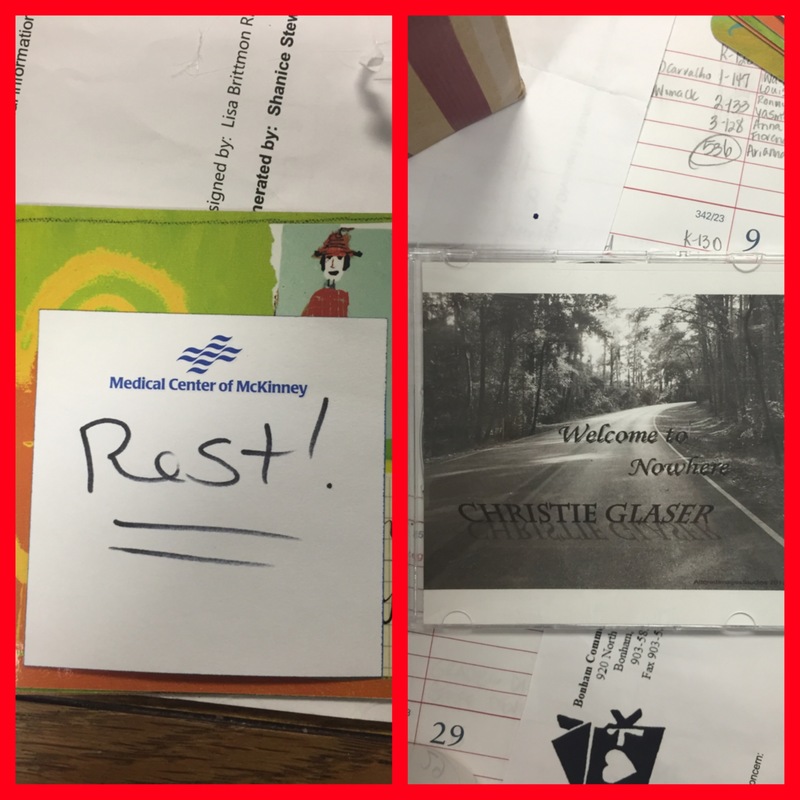 One gift that especially touched my heart was one from my friend, Christie. We ‘knew of’ each other in high school as we had mutual friends, but never really ran in the same circles. She is working at my school this year and, in getting to know her, I feel like I have found a long-lost soul mate! Imagine my excitement when I also learned that she is a runner and had trained for a marathon. 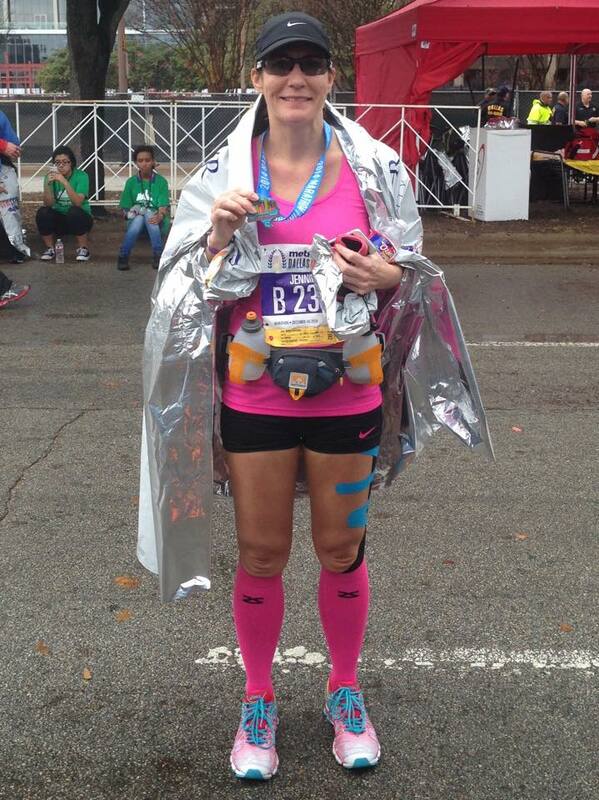 She was unable to run it due to all sorts of knee injuries just before the race that ended up requiring surgery. When she saw me after the marathon, she gave me a big hug and I nearly cried!! 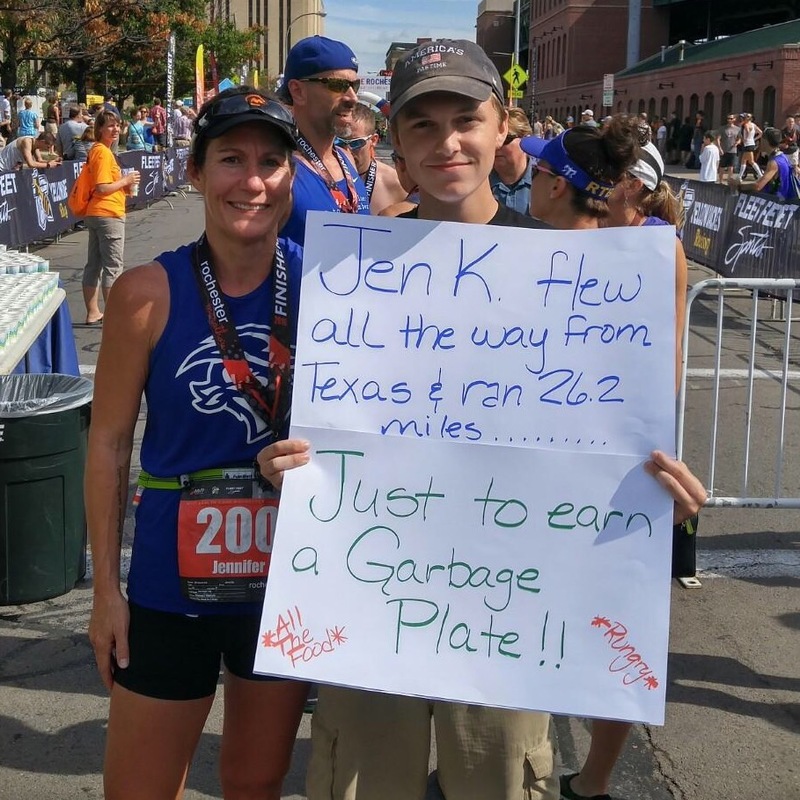 The well wishes mean so much, but even more coming from a fellow runner – one who KNOWS what it means to cross the finish line. 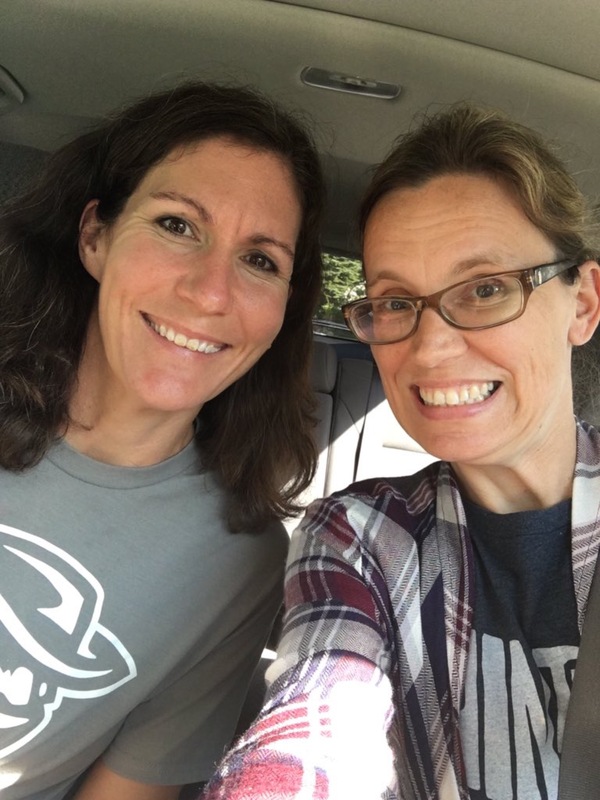 AND as we were talking about my recovery plan yesterday, we decided to run a half marathon together…..in the Fall (calm down, Jane!!). This morning I found this hanging on my door. 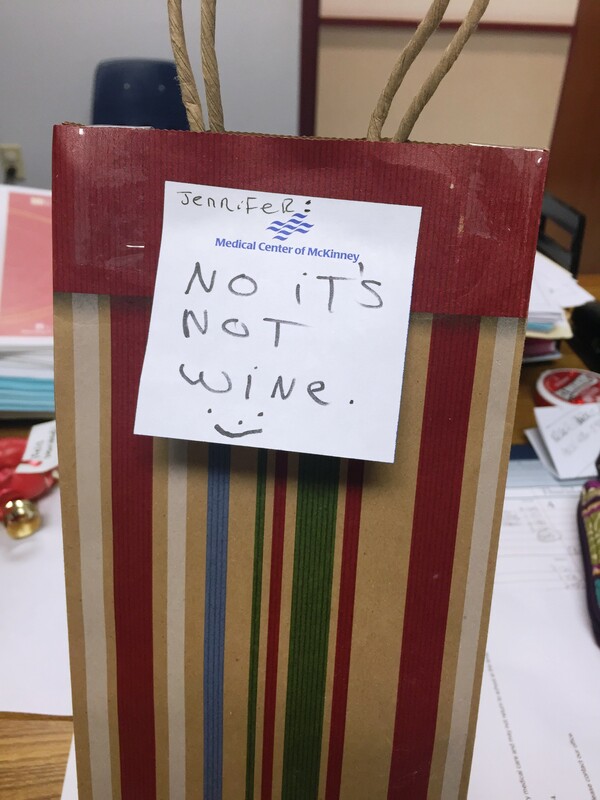 OK, this brought about some sadness, because it wasn’t wine, but I laughed at the note. Do I have THAT big of a reputation as a wine lover?? When I looked inside, I was blown away. Plus, she shared her CD with me. I can’t wait to listen to it! I’m definitely counting my blessings morning for unexpected friendships! !